Photo: Papyrus were found close to the Red Sea. The editors of Archaeology magazine have selected the top 10 archaeological discoveries of 2013. Among them is the world’s oldest port, located in Wadi el-Jarf, Egypt. While excavating an underground storage system cut into bedrock at Wadi el-Jarf, nearly 110 miles south of Suez and close to the Red Sea, archaeologists discovered fragments of boats, ropes, and pottery. The artifacts date to the reign of the 4th Dynasty King Khufu, or Cheops, builder of the Great Pyramid of Giza, who ruled from 2551 to 2528 B.C. Beginning on the shore and continuing underwater, an assembly of large blocks and limestone slabs inscribed with Cheops’ name form the remains of an L-shaped jetty. Limestone anchors from numerous large ships testify to voyages launched to export copper and stones from the Sinai Peninsula to the Nile Valley. “Ancient inland harbors are known on riversides, but the jetty of Wadi el-Jarf predates by more than 1,000 years any other known structure of this kind,” says expedition leader Pierre Tallet, a University of Paris-Sorbonne Egyptologist, about the 4,500-year-old harbor. 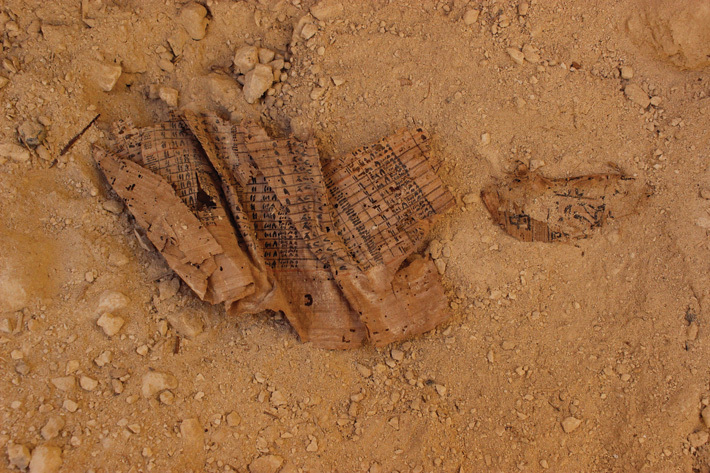 Visit Archaeology magazine online and read more about the top 10 archaeological discoveries of 2013. This entry was posted in Archaeology, Egypt and tagged Archaeology, Egypt, Wadi el-Jarf. Bookmark the permalink.